Analysts say more than 7 million people voted in a symbolic referendum to reject President Nicolas Maduro's plans to rewrite the constitution. Millions of Venezuelans voted to reject President Nicolas Maduro's plans to rewrite the constitution, but their votes likely won't have an impact. More than 7 million voters around the world took part in a symbolic referendum organized by the country's opposition parties. Venezuela's president didn't sanction the referendum and, therefore, condemned the vote as illegitimate and illegal. 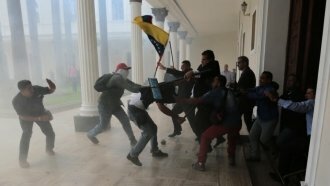 But opposition leaders hope the symbolic victory will help undermine the July 30 vote organized by Maduro. That vote will elect a constituent assembly, and Maduro's ultimate goal is rewriting the country's constitution. Critics say they're afraid Maduro will use the rewrite to get rid of democratic elections. The non-binding referendum results come as Venezuela continues to struggle with a crippling economic crisis and months of anti-government unrest. After Sunday's results, Maduro said he's still pushing forward to the July 30 vote.